America is fortunate to have a fine number of conservative talk show hosts from coast to coast. They do a fantastic job getting the conservative viewpoint across, and giving airtime to those seeking or trying remain in office who represent our views. However, this isn’t enough. Many of these people have good intentions, but cannot convey truth in light of scriptural principles. A majority of our politicians are timid on crucial issues because of the lack of public outcry, and that’s where the pulpits come in. Pastors must boldly present truth in their churches on the issues affecting our nation. Once the people are enlightened, realizing how much danger we’re in and whats at stake, they’ll put political heat on their representative to ensure they vote morally and according the Consitution. If pastors were to do this, I’m sure it would ruffle the feathers of some churchgoers. Christ said it would, but that’s what scripture does. According to Doctor J. Vernon McGee hearing biblical truth, especially our need of a Savior, will either enrage or convict a person. It is imperitive at this hour the pulpits begin to outline the dangers of ignoring right to life and our relationship with Israel (to name a few). It is their duty to ‘stand on the wall and cry out’ of the approaching danger. If they have empty seats the following Sunday, so be it. People walked away from Christ, too (John 6:66). Once Christians wake up there may be an uproar, and our elected officials may then do what is morally right in order to hold on to their job. 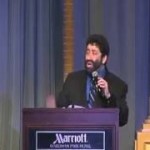 Jonathan Cahn led the way this week at the Presidential Inaugural Prayer breakfast in Washington D.C. He’s on the wall warning of the danger, and you’ll see that many booed him or walked out. No one ever said it would be easy. You have to choose what side you’re on. This entry was posted on Friday, January 25th, 2013 at 5:10 am	and is filed under Political. You can follow any responses to this entry through the RSS 2.0 feed. You can leave a response, or trackback from your own site. Wow!! I pray Jonathan Cahn’s awesome address will open the hearts in the halls of Congress, the White House and especially the people of this land. May God use him and his prophetic words to touch the hearts of this nation and awaken in us the resolve to follow God’s laws, direction and not be ashamed or embarrassed to step out as His hands, feet and mouth. I just read Cahn’s book “Harbinger”. If you have not read it, you must do so. It has changed my perspective in several fronts.